When I first started living alone restaurant food was something that entered my kitchen regularly. The long commute and hard work as a fresher made me so tired that almost every other day I called up the corner restaurant and ordered in roti, dal and sabzi (flat bread, lentils and vegetable curry) and other days survived on Maggi and scrambled eggs. Those days I only cooked on weekends when close friends would come together and we feasted on home cooked simple meals that we craved most. I used to make rice, dal, sabzi and fish, paneer or egg curry and nearly every month Maa or Dida provided me with light recipes. Every Saturday we gathered after work (half days) and chatted and gossiped late in the night, We would wake up late and sitting on the unmade bed on the floor with our hot cuppas will soon pick up the chat session where we left it the earlier night and would giggle for long. The leg pulling session continued and our gang of girls lazed around while we cut and wash vegetables and start cooking. 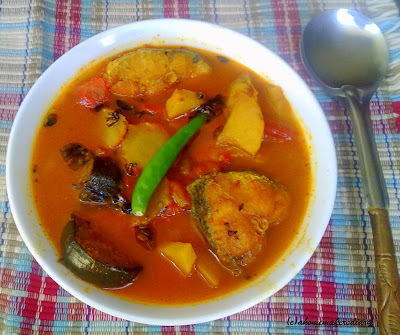 This recipe of tomato’r jhol with egg plant and potatoes (provided by Dida) was a regular at that time as it is very versatile, requires very few ingredients, and also has a tongue tickling taste that our nearly numb tongues from eating regular restaurant foods really needed. It used to fill every corner of my small pad with a lovely aroma that suddenly made my friends to complete their cores at the earliest. The three of us then sit cross legged on the floor and eat from whatever few plates and bowls I owned. We ate silently, scraping our plates clean and enjoying every morsel. Today when I prepared this dish and that same fragrance of roasted Panchforon and tomatoes filled every corner of my house it reminded me of those days of pure joy, when we were free of responsibilities and tensions and cherished each and every moment of life. Am thankful to God for where my life has taken me but every now and then something stimulates memories and I long to live that life once again, stretch my hands to touch those giggling faces. I know I can’t do that so I sniffed in that familiar aroma and gave them a call and again chatted and giggled for long. This recipe is very light yet flavorful and promises a satisfying meal. The best parts are its fragrance and colour which could be best enjoyed with steamed white rice. Today I made the dish with fish but the vegetarian version with paneer tastes equally good. Even my now 10 month’s old son enjoys this jhol with fish. 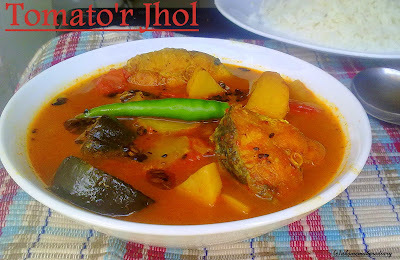 This light juicy jhol is best enjoyed fresh as the fish and vegetables soak the tartness if refrigerated. If you want to cook larger portions then next day add a few spoonful of tamarind juice during heating. That will restore the taste without much work. The white stem of cauliflower (optional): We love this white crunchy inner part and always add this Macher Tak(fish in amchur based gravy) or Tomato’r jhol. Peel and slice the potato and the inner white part of cauliflower stem thinly. Cut the eggplant in half and then slice in medium thick pieces. Wash and keep aside. Cut the tomatoes in quarter and sprinkle some salt. Wash the fish and rub with salt and turmeric. Heat the oil in a pan or kadhai and fry them till lightly brown on both sides. Take them out and reserve. In the same oil lightly fry the sliced potatoes, eggplants and cauliflower stem with salt and turmeric. Reserve. In that same oil add the slited red chillies and panchforon. When you get the aroma add tomatoes and give everything a good stir. Add salt, turmeric and cover. Let it cook on low for 7-8 minutes or till the tomatoes are mushy. With a spatula mash the tomatoes smooth and cook till it starts to stick the bottom of the pan. Add the veggies and 2 cups of water. Bring to a boil and add the fried fish pieces. cover and cook till the veggies are soft and the gravy thickens a little. Vegetarian Version: If you are using Paneer then cut in cubes and lightly fry them with salt. Follow the same procedure but with paneer you can also use thinly sliced carrots and beans. Enjoy with hot steamed rice and any other side dish of your choice. My family loves it with Alu Posto or Alu bhaja. Don't know how but who ever have eaten it has fallen in love with this humble vibrant dish. 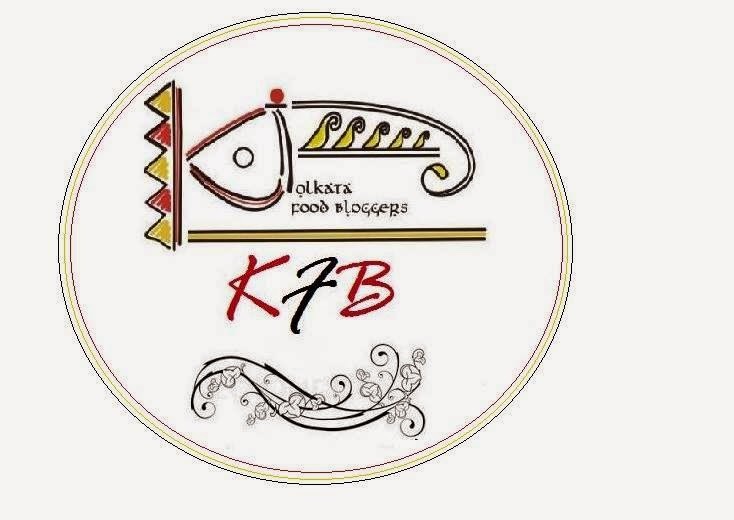 Am sending this humble light fish curry to Arundhuti's Served with love.A beautiful event that she has started at great blog, Gourmet Affair. 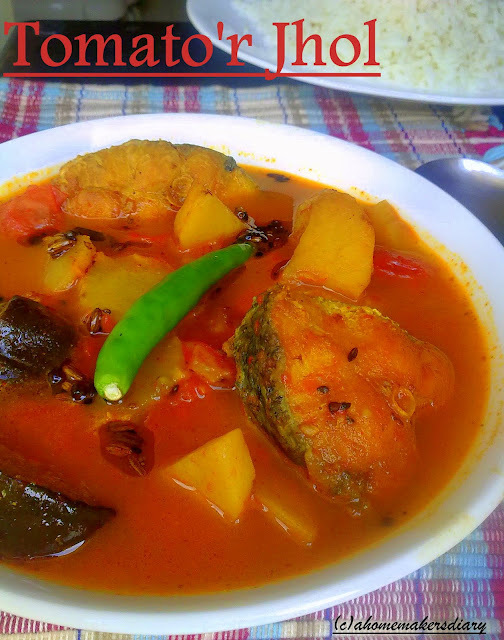 Omg, wat a fantastic and catchy fish curry, looks yummyilicious.. It looks delicious.I will try this recipe with paneer .Thanks for giving suggestions for vegetarians. This is a lovely fish preparation no doubt. Around my parts pairing eggplant with fish was never be heard of but eggplant tastes best with tamarind or tomato, same with fish, so pairing the two just makes sense. Lovely post Sayantani. Love reading food stories and I could really relate with a lot of what you wrote. I first felt at home at Mumbai when we took up a rented flat and began cooking. First was chicken made with a readymade curry mix on an elctric stove given by my then future mom in law. Tomato jhal or the onion less curry is difficult to manage in terms of consistency. I don't even attempt it and stick to kaalia. love this fish with tomato gravy dish! It was so wonderful reading about your hostel life; it reminded me of my hostel days. nice click too. @thanks again that you liked this. @Adukalavishesham, Kalyan and Deepa. thanks for visiting my page. 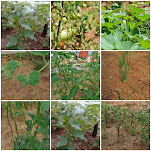 @Padhu, I guess its better always to give the vegetarian idea as well. glad that you liked it. Lovely blog, this looks absolutely delicious! Dear Sayantani..what an awesome and comforting dish..Tomato'r Jhol looks simply delicious and mouth watering good. You are one rocking writer as well. LOved reading about your Dida..it was very beautifully written and that way got a chance to check out the vegetable peel subzi as well.Ur Dida was a remarkable woman so well ahead of her time..
and let me try this Jhol for my husband:)..he wuld luv it ..
@Sandeepa, I know you would like it, when I was posting I really thought of your light fish dishes. You know, I used to quite enjoy cooking once upon a time, when we were based outside Calcutta. Once we were back, the easily availability of cooks, my job, our child, the nitty-gritties of running a household, all of tihs resulted in my going into the kitchen only to make some signature dishes. I was always at a loss when it came to homely food. Recently, our maid left, and I am yet to find another one. Sure, I can order from restaurants, but it feels horrible after some time! I chanced upon your blog and am loving it! Not only the narrating style, even the pictures are so beautiful. They make me want to try each recipe. I am quite a foodie and I know when an item has been v well made. I can tell from yours that all of them have been done so well. For instance, even the cakes and bakes look so wholesome and well-done. 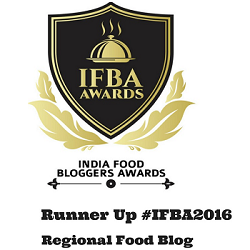 I have visited other blogs, you can tell the cakes have acquired too fine a texture (like those Britannia cakes) and just won't do.... not yours, ever!